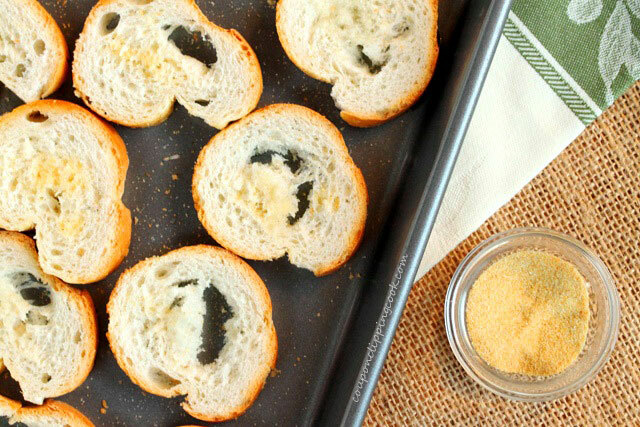 Looks and tastes fancy, and quick and easy to make. 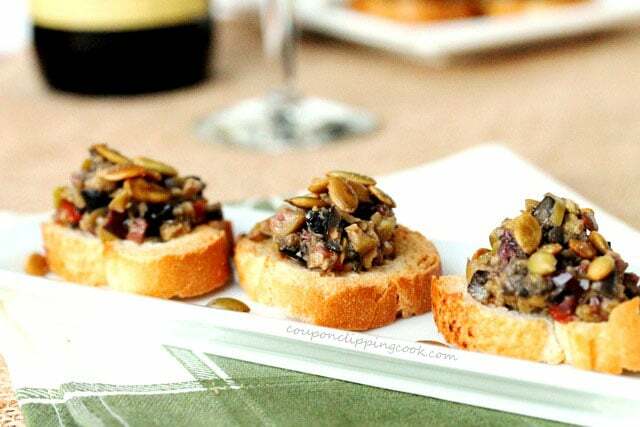 Some markets have olive bars which come in handy when making appetizers like this with olive tapenade. The olive bars are nice because they have assorted Greek, black, and green olives where you can pick and choose just what, or how much you like. I finally gave some of these olives a try and wow, they were so good. They were salty and so tasty….perfect for a tapenade. 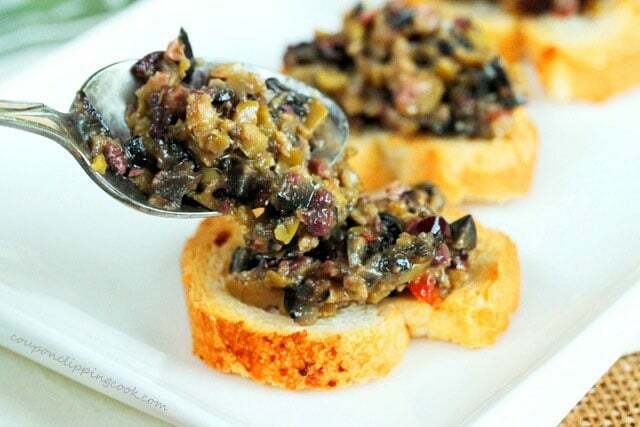 Generally, a tapenade is made with ingredients that include olives, capers, anchovies, and olive oil. But I took a shortcut in this recipe and only included the assorted olives and olive oil. 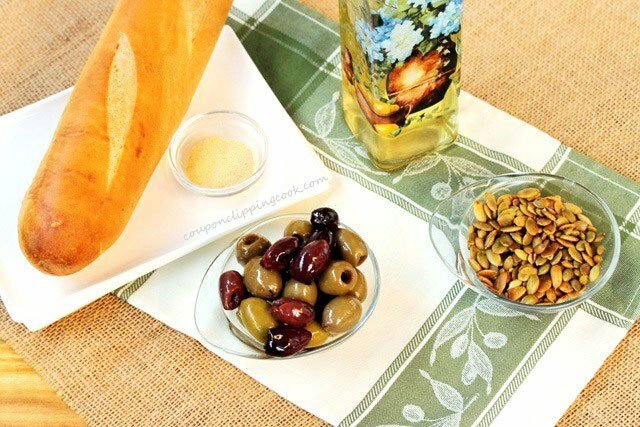 The olives in this recipe are Kalamata Black Olives (the kind on Greek salads), Stuffed Green Olives (the pimento adds a nice color), and Plum Olives. All of them were savory and filled with so much flavor that my mouth is watering just writing about it. 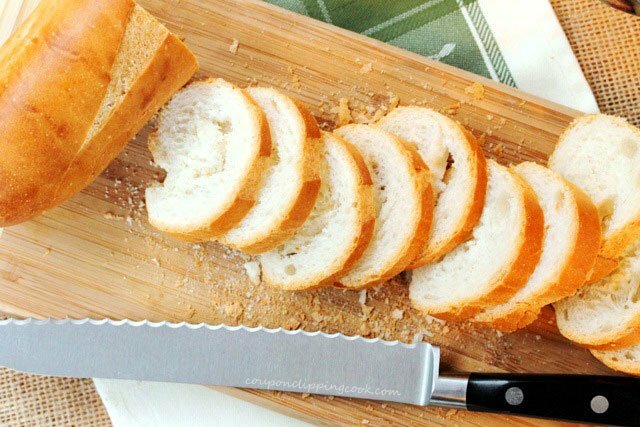 Slice the bread in 1/2 inch thick slices (the baguette should yield about 15 slices). 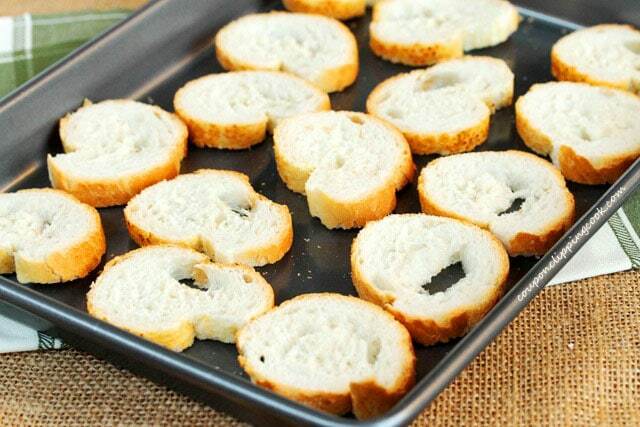 On a large cookie sheet pan, lay out the slices of bread. 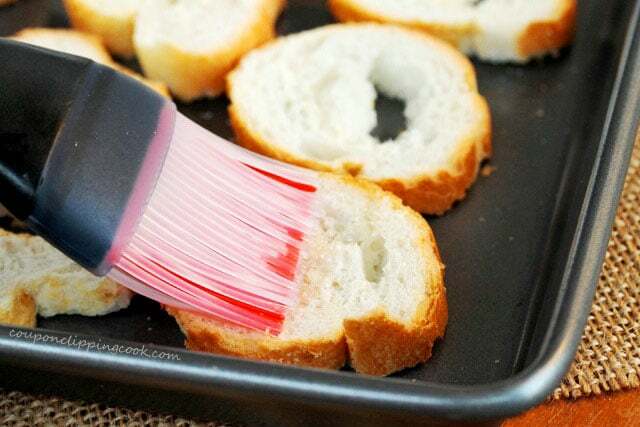 brush olive oil over the bread. sprinkle granulated garlic on top. Bake the bread until it turns a light golden color around the outside edges (about 10 minutes). 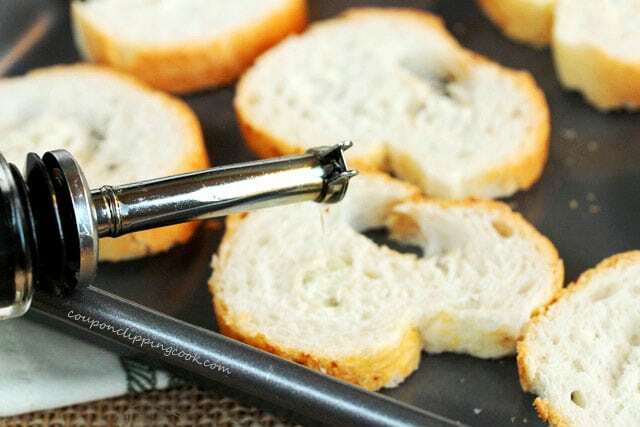 Watch the bread closely to make sure it doesn’t turn too brown. Make sure the olives are pitted. If it’s possible they could have pits in them, cut them in half just to make sure and remove the pits if applicable. 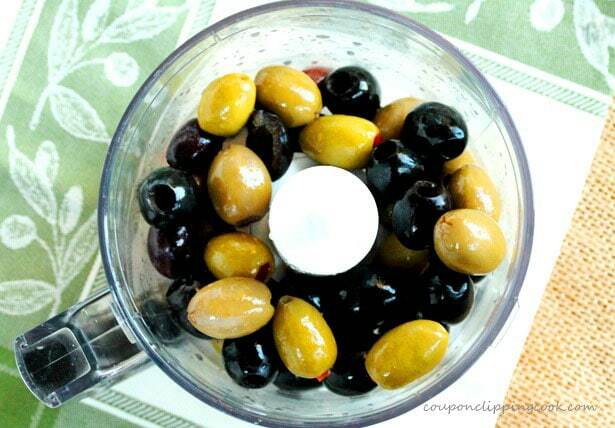 To a food processor, add the olives. Pulse 3 to 5 times, just enough so that the olives are diced. 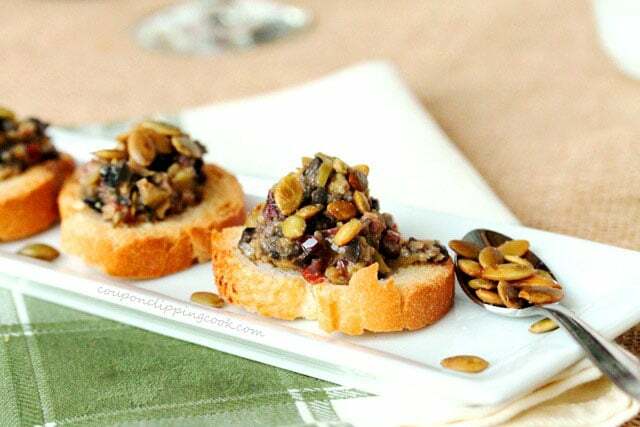 To Serve – to each piece of garlic toast, top with olive tapenade. 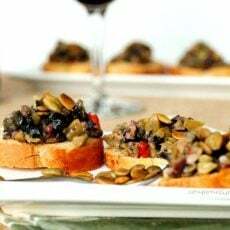 Top with the roasted salted pepita seeds (pumpkin seeds) and serve. 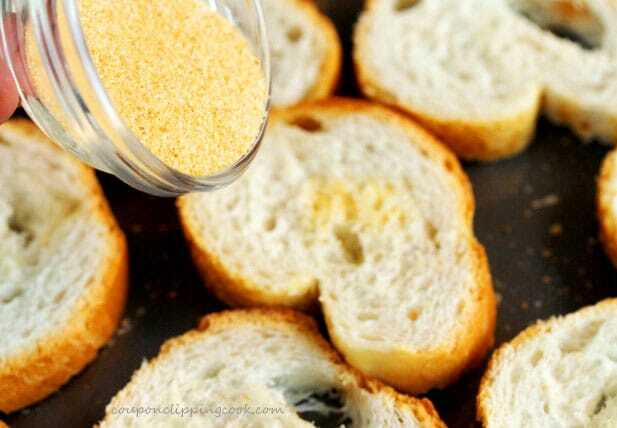 Brush 1 tablespoon olive oil over the bread and sprinkle granulated garlic on top. Watch the bread closely to make sure it doesn’t turn too brown. Remove from the oven and set aside. Make sure the olives are pitted. If it's possible they could have pits in them, cut them in half just to make sure and remove the pits if applicable. 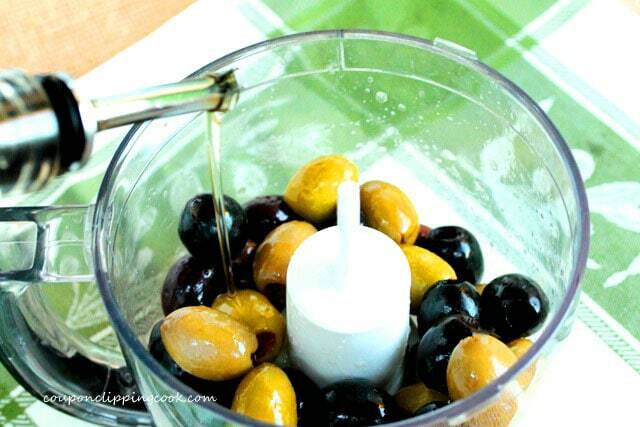 To a food processor, add the olives and olive oil. Pulse 3 to 5 times, just enough so that the olives are diced. 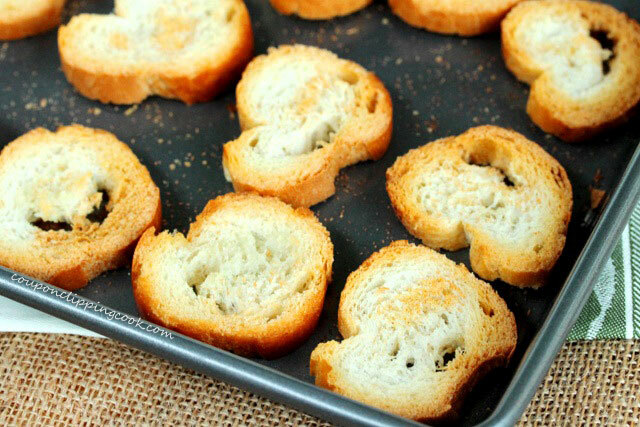 To Serve - To each piece of garlic toast, top with tapenade. 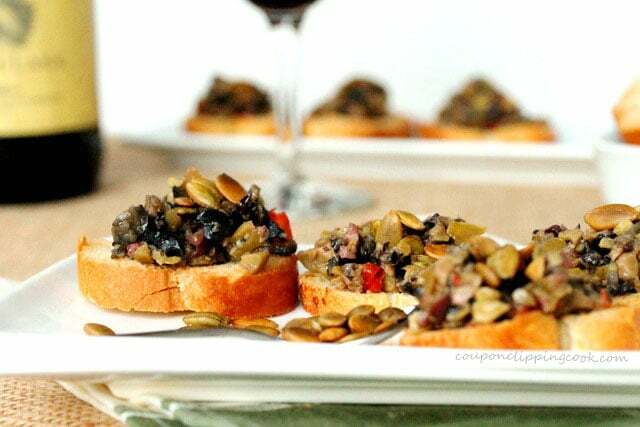 Garnish with pepita seeds and serve. Hi Chris, we must have been on the same wavelength! 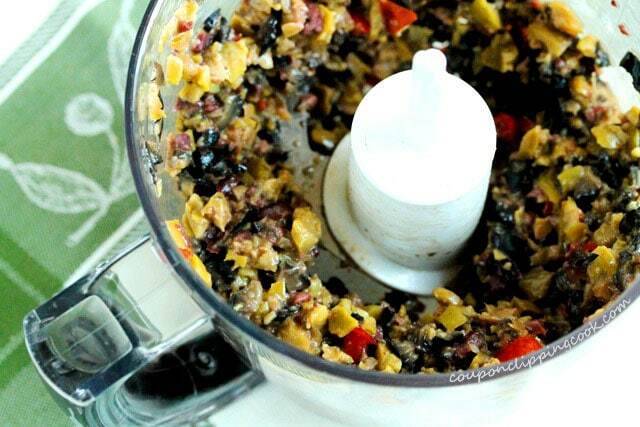 I love the idea of stuffing the tapenade in cherry tomatoes…sounds so pretty and delicious. I had it for Thanksgiving with crackers but I actually like your idea better. So glad you commented on this recipe. I know what you mean about how some versions don’t look so great when they’re too mushy, the same thoughts cross my mind. Thank you for stopping by and have a great rest of the day! 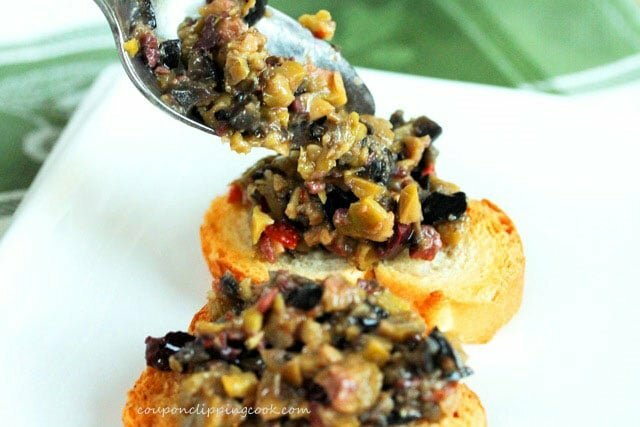 It´s really all about great olives, long time since my last tapenade so I´ll be olivehunting soon! Hi Fred, it sure is. I had no idea what I was missing. Now I’m hooked. Thank you for stopping by!